My nine year old daughter, Grace, is a big fan of the Dreamworks film How to Train Your Dragon, as well as the Netflix exclusive series Dragons: Race to the Edge. 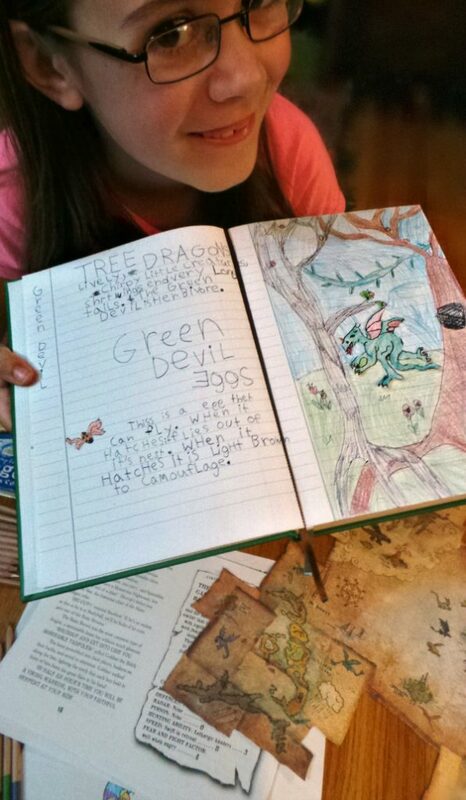 So much so that she decided she wanted to create her own “Book of Dragons”. Mostly this consists of her drawing various dragons, some based on beasts that appear in the show, and others being creatures that she makes up on her own. 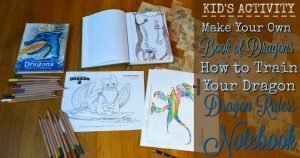 Parts of the book are based off of printables that I found online, while other parts were created by studying the Dragonpedia section of the official Dreamworks Dragons website. My daughter’s desire to make her own dragon rider notebook was at least in part inspired by reading Cressida Cowell’s The (In)Complete Book of Dragons. When Grace told me that she wanted to create her own dragon book I was easily sold on the idea. Let’s see, helps her practice her reading, writing and drawing skills and keeps her quietly entertained for multiple hours in a row. Yeah, no arguments here. A girl with a plan, she almost immediately started drawing and carefully cutting out dragons that she wanted to add to her book. Seeing that she was serious about wanting to make a book of her own I picked her up a blank lined journal on sale for $5 at Winners. Given that we already own enough coloured pencils, crayons and markers to outfit a medium sized classroom or two, spending $5 on that journal was the only money put out towards creating her book (If you want to grab a blank journal online, this one is relatively cheap and very cool looking). I opted for a lined journal, over a blank artist’s notebook, because I wanted to emphasise working on her writing skills. (Yep, I’m a tricky mom. Yes, I am.) Some pages she filled with writing, while on others she drew the background scenes for her dragons to fit into. The dragons themselves were drawn on art paper, carefully cut out, and then glued into her book. I also spent an hour or two searching around online and I found some great resources for helping to make her dragon book complete, everything from colouring sheets to PDF samples of some of Cowell’s books. In the end, Gracie now has a book which she has created on her own, one that she has put many hours into and is justifiably proud of, and one that she keeps going back to, adding more bits and pieces to her “Life of Dragons”. I’m proud of her for putting so much work into it (and secretly pleased that she’s been spending the summer working on her spelling and penmanship). You will need: a blank book, drawing supplies (pens, pencils, coloured pencils, markers, etc), scissors, glue, art paper, printer paper and access to a printer. The Dragonpedia section of the official Dreamworks Dragons website. This ever growing encyclopedia of dragons is home to information about over fifty different species. There are write-ups about each dragon, and stills taken from the various How to Train Your Dragon films and television episodes. This is a great spot for inspiration. 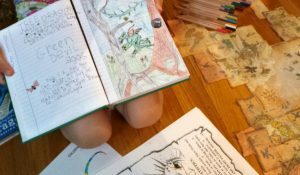 If your child needs a little kickstart on what to write in their own book they can borrow information from these write-ups, while the images make a great reference for drawing their own dragons. The How to Train Your Dragon Books section of Cressida Cowell’s official website. The site includes synopses of the thirteen books which have been published in the series (so far), as well as character bios, location maps, and tidbits from the author. The Dreamworks version of Hiccup, Toothless, and the others, are different in many ways from the book versions. Both are fantastic in their own ways. I urge you to keep an open mind. Various things you may want to print out (and possibly cut up) to help create your own dragon book. This can be particularly helpful for younger artists who can get frustrated when their Night Fury or Deadly Nadder doesn’t look quite like the one they saw on TV. Read Cressida Cowell’s How to Train Your Dragon books, which you can grab on Amazon, or look for at your local library. I also suggest consulting books on how to draw dragons. I gave Grace a book called “How to Draw Dragons”. This book was something I had from when I was a child and is long out of print. A good substitute might be something like Ralph Masiello’s Dragon Drawing Book or Drawing Dragons by Sandra Staple. 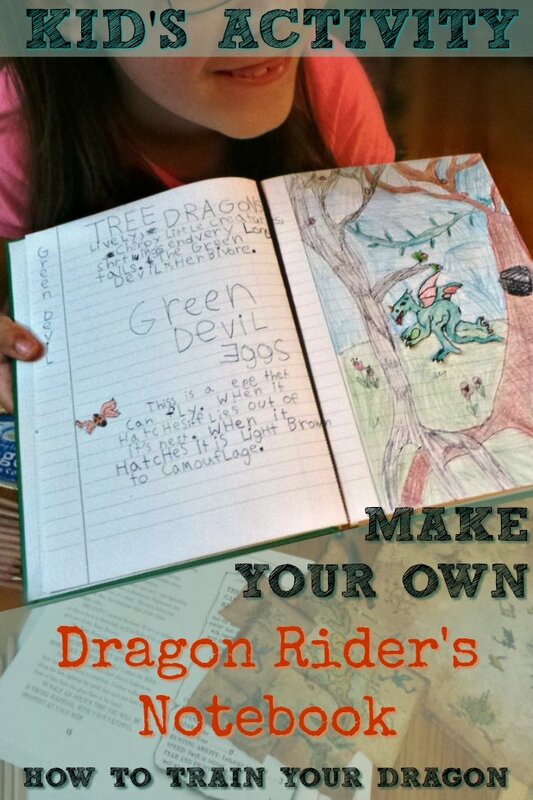 If you do end up making your own dragon book I’d love to hear about it (my daughter would be tickled pink to know other people are out there creating their own dragon rider notebooks). How wonderfully creative your daughter is. She put a lot of thought and work into her project and it shows. I can see why you’re both proud of her book. Way to go Rainbow! My daughter had a ‘How to train your dragon’ birthday party last year and as part of the party favor I made each child a dragon book that they could fill on their own. My daughter LOVES your daughters map, How did she/you do it? Or where is it from please? I love that as a birthday party theme! What a cool favour to send home with the kids (I may totally steal this idea for our next party). The map in the photo was a special item that was sent to everyone that was part of the Netflix Stream Team in 2016. I think they had them printed up just specifically to send to us, and I don’t believe they are available for sale anywhere. 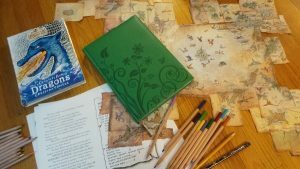 If your daughter is really keen on a copy of Hiccup’s map, perhaps you could try doing something like what this person did (https://jennis41digsdragons.tumblr.com/post/124417418689/hicksderhune-its-done-i-made-hiccups-map-from) and screen cap the map from the official website, and then print it out in pieces and assemble it on a big piece of poster board. I am 9 and a girl just like your kid, I love dragons! I can’t view my own comment? Hi Hanna, Your comment was sitting waiting for me to approve it. Sometime the automated system thinks a genuine comment is spam, and sets it aside for me to look at before it gets published. Never fear, each comment you entered went through. I’m just approving them now. I used to have a notebook, but my dad stole it! And now I can’t do a project like a normal nine year old.